After computer issues and other set backs, we’re back in recording mode. 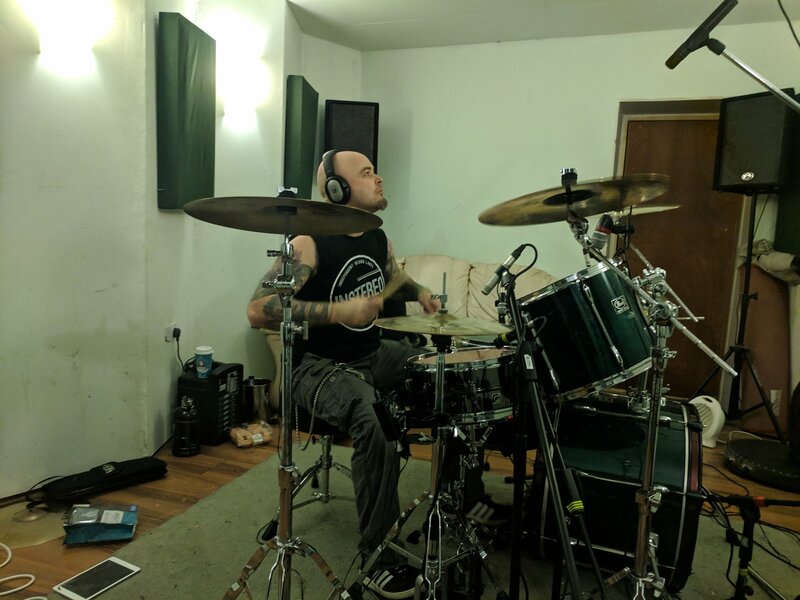 With everything previously recorded for this album having to be trashed, we moved our gear into a new studio (who we share with Spun) and now have a room we can leave everything set up, which makes things a lot quicker. 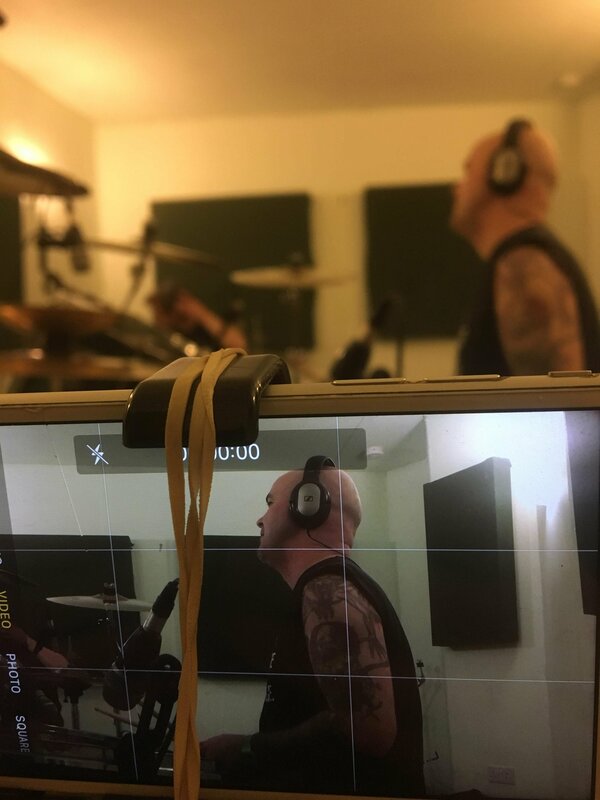 We started with a few test recording sessions that ended up going so well, we’ve decided to keep them. 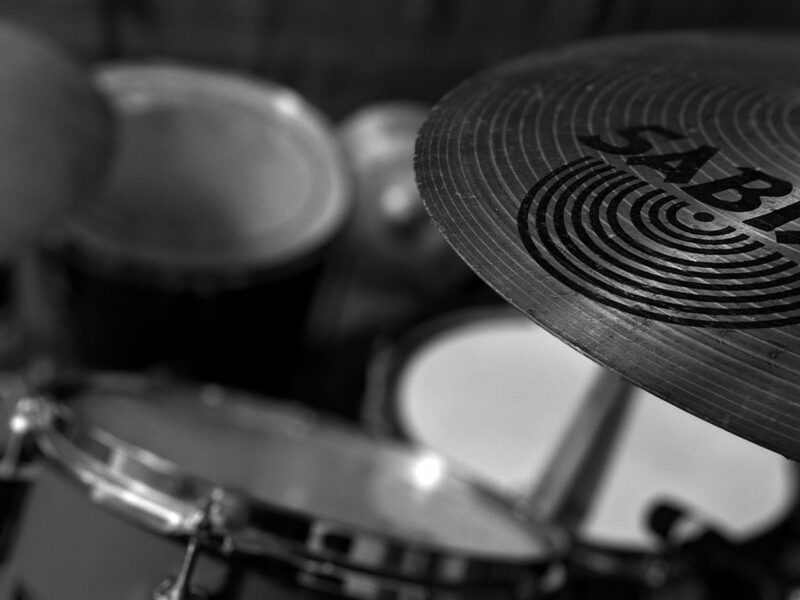 I recorded about 25 drums tracks in a few days, so we are getting back to speed pretty fast. 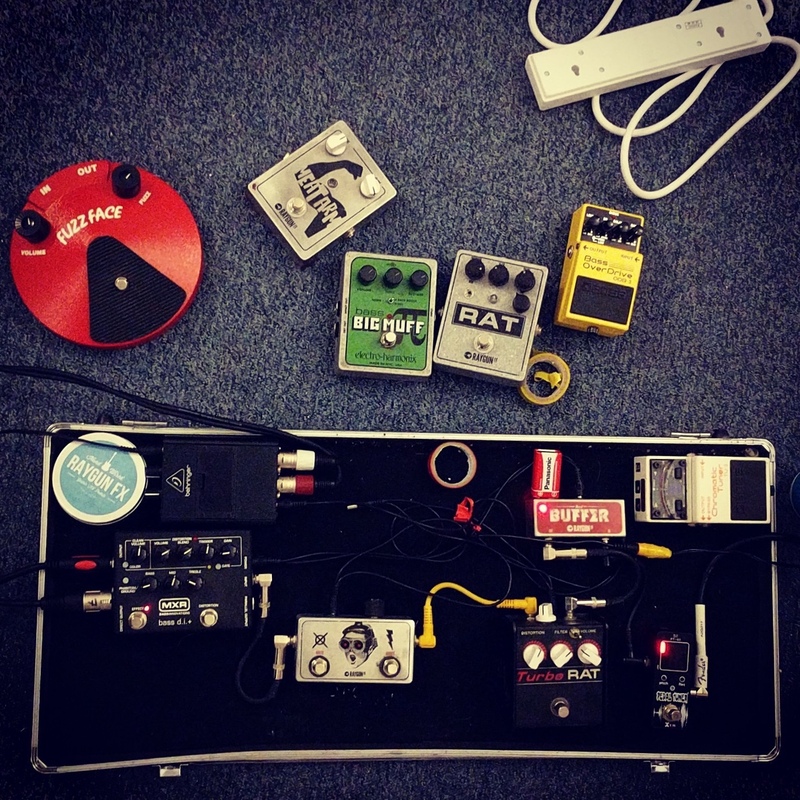 Lee tracked down some new bass parts, using a dual RAT distortion I made a few years ago. It sounds pretty hairy! – And it sits so nice with the new drums sound we have been getting. Whilst we’re re-recording songs, we’ve started working on some new demos at the same time, which is keeping it fresh. There’s about 50 songs demoed for this album, and it’s getting really hard to pick what songs/direction we are going to go in. Vocals on Thursday, can’t wait to try out that new Aston mic! For the past 4 sessions we have been tracking Drums, Bass and Guitars to 8 tracks out of the ridiculous 40 song list. Road, Hello, Lips, Skinny Head & Red Beard. 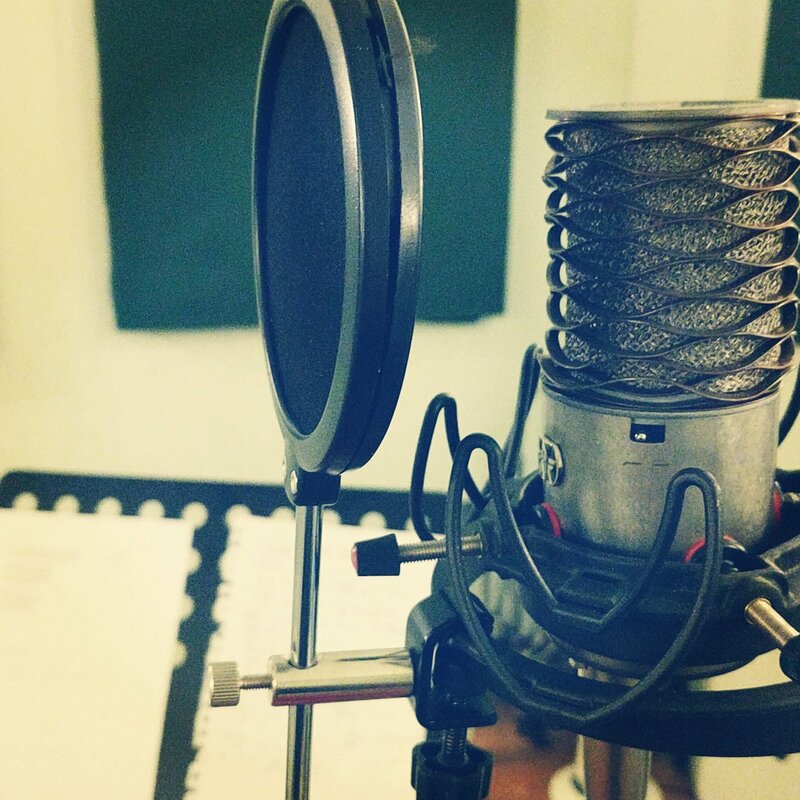 When we record vocals, we usually record 3-4 takes of lead vocals, then pick the best one. This time, we’ll pick the best bits of each take and piece together the parts that fit it best. To record vocals, we use the Aston Origin, which doesn’t just look amazing, it sounds brilliant on pretty much anything. 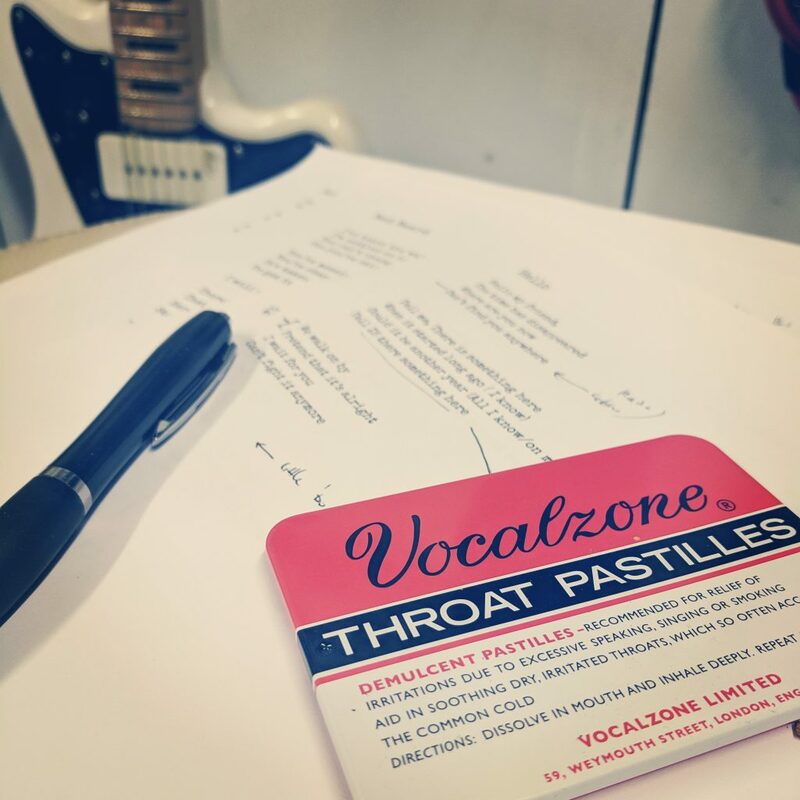 Lead vocals (and backing) usually get double tracked, plus a lot of backing vocal ideas get put down, but not everything ends up in the final mix. 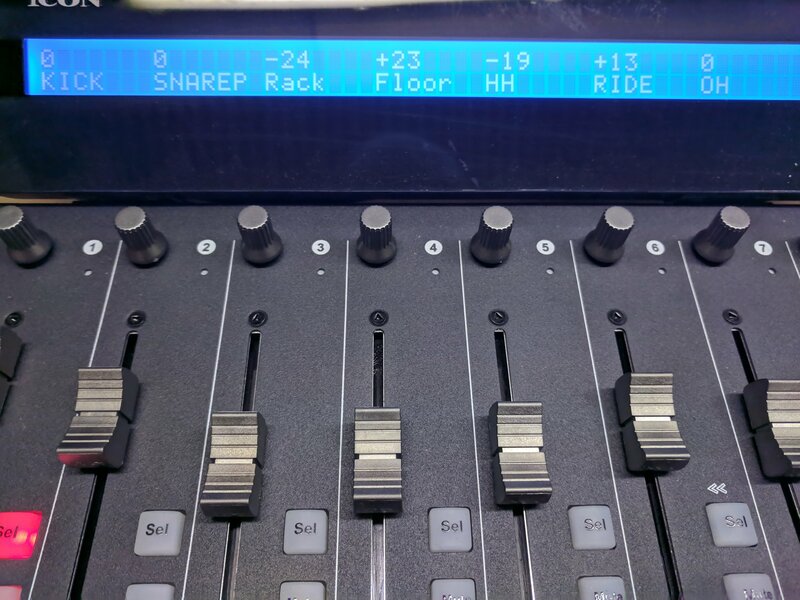 It’s good to record more than you need and have options when mixing. Dave also provided some backing vocals on Skinny Head & Red Beard. I didn’t realise he could sing that high, and then he says ‘I can hear another even higher vocal’ and then he actually did it. haha! It sounds huge! 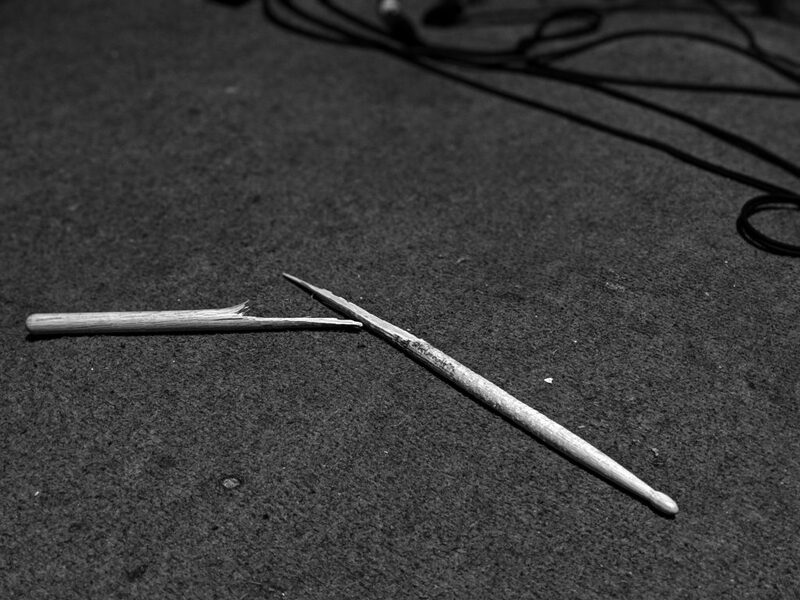 Next week we have 3 tracks to starting recording Vocals too and a few left over parts to finish. Once this session is complete, we will take a step back and start making some decisions on what tracks to release, what is next to record and also make a start mixing. It’s going to be a busy few months for us. Almost half way there now! Tonight we finished off the two remaining tracks, Hung & Another Skeleton. I had a chance to try an new OP Amp Big Muff Fuzz Pedal (Smashing Pumpkins model) and it sounded huge, Like ripping velcro of a Yeti. A couple of tracks had a few acoustic parts to try out, so we quickly set up 2 mics, one close and one far away, picking up the nice ambience of the room. Once the acoustics were nailed, me and Dave laid down some shakers on Sludge, which sounds pretty sweet. With more Drum & Bass tracked for another 8 songs, it was time to get fuzzy with some Guitars. 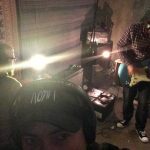 These songs are a little more straight forward, but we still had some cool ideas to experiment with. Different fuzzes mixed at different times create huge differences throughout one song. It was a cold evening and the Coffee machine was broken, but we worked solid through 6 songs, each with about 6-8 guitar tracks. On one track (Red Beard) I could hear an idea, kind of like morse code or something glitching in and out, almost like keyboard sound. 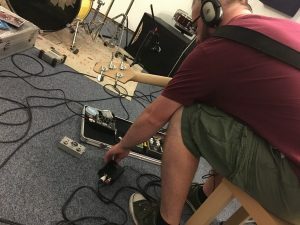 – With the help of a few pedals, including a Boss Phase Shifter, we manage to get this weird, but awesome sound. I can’t really explain it, but it will be hidden in the mix somewhere! These tracks have such a good feel to them, reminds me of music around the late 90’s. I can’t wait to hear how they’re going to sound finished. 2 more guitar tracks to finish next week, along with some overdubs and some acoustic. 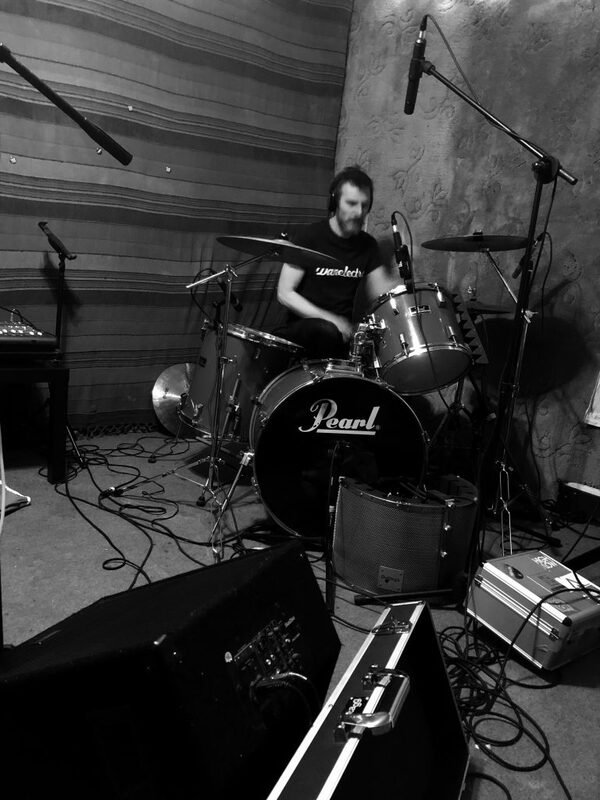 After we spent the last two weeks jamming through this next batch of songs, it was time to lay down the Drum tracks. We spent an hour setting up, tuning the kit, and tweaking mics before getting a coffee and discussing the plan for todays session. Using my original demo as a guide track, Dave blasted through several solid takes for each song. 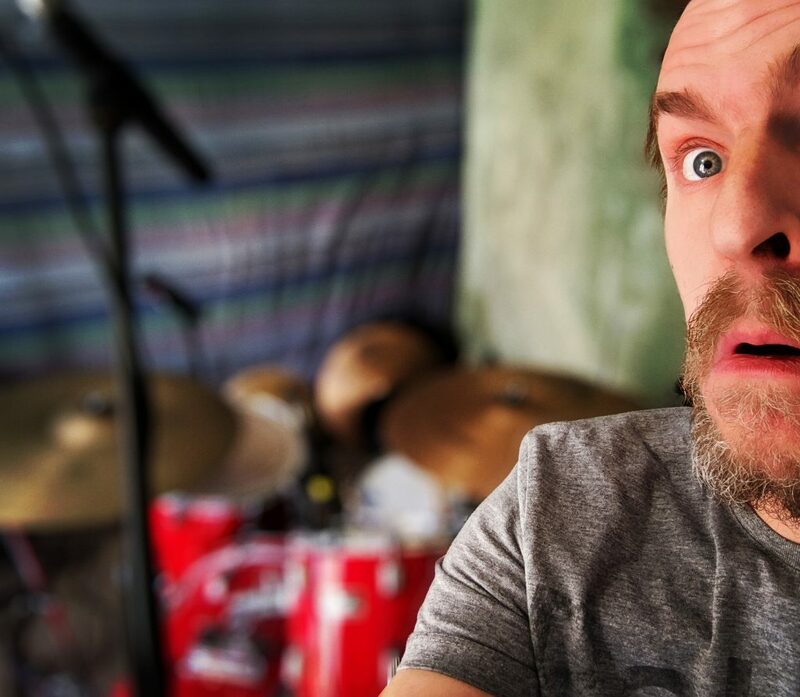 That’s now 23 songs with drum tracks! I have no idea how we’ll pick out songs to release. There’s a lot still to come. Next week we’ll get some bass cooking, before guitar, vocals, backing vocals and overdubs. A nice mix of old and new song ideas, it’s amazing to finally hear them come to life. 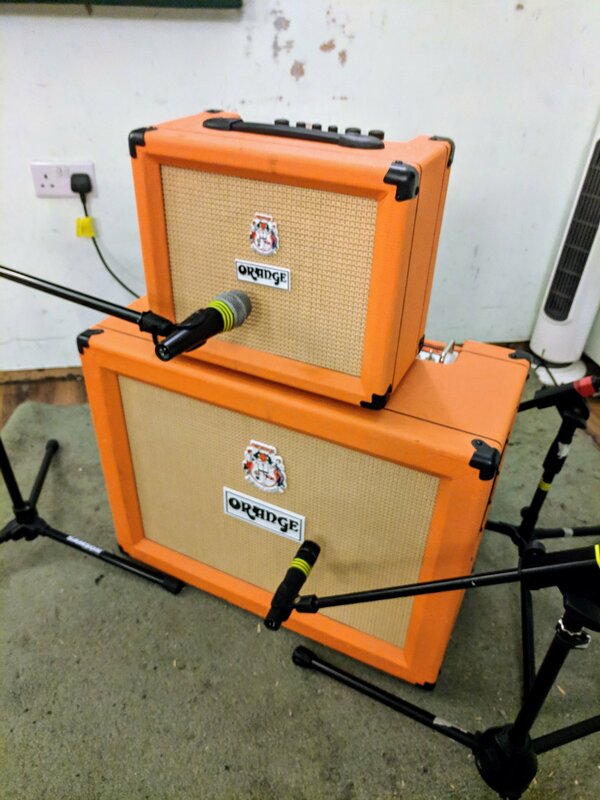 We messed about using a mix of big and little amps, getting some pretty cool results. As always, its super fuzzy. Today went too fast, I could of done another session, but it’ll have to wait until next week, with another 4 songs to piece together. 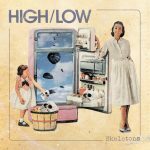 During July, before Skeletons had even hit the shelves, we recorded another 9 tracks from the long list of demos I had built up over the past couple of years. Starting 17th July, we hit the studio once a week tracking these songs over six sessions. 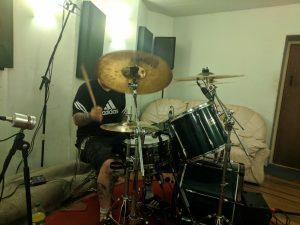 Me and Dave had a productive 4 hour session, he blasted through 9 drum tracks without a sweat. We used that crazy Wasaphone Mic on the side of the kit, it’s got a dirty, crunchy sound. 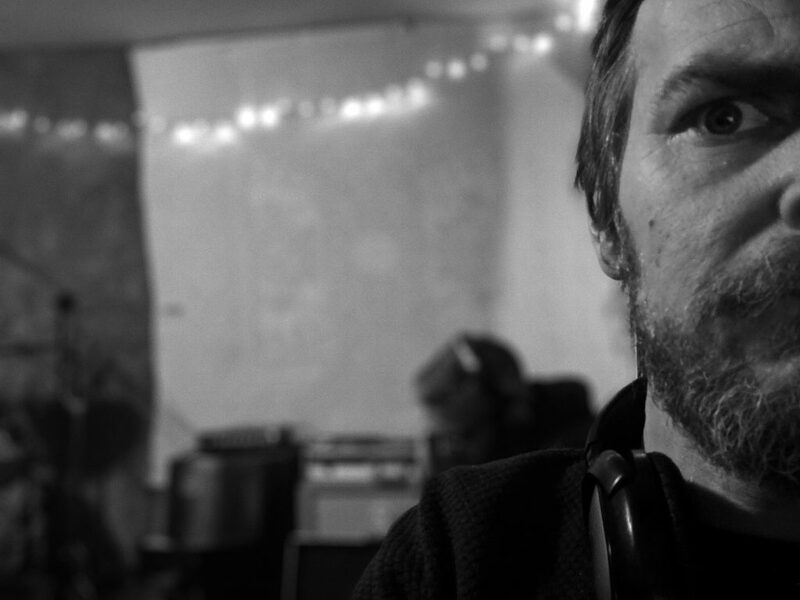 Lee had a re-scheduled Pearl Jam gig to attend to, however his parts would follow next week. Lee was back and ready to nail some bass lines down. 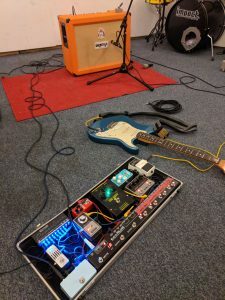 With a Di Box and 2 cabs hooked up, one being a cheap guitar cab, he slammed through them, even getting some great bits of feedback in ‘Bob goes Mould’, it sounded like an old Hammond Organ. Now we have a chunky rhythm section down, I can make lay some guitars over and start adding some layers. 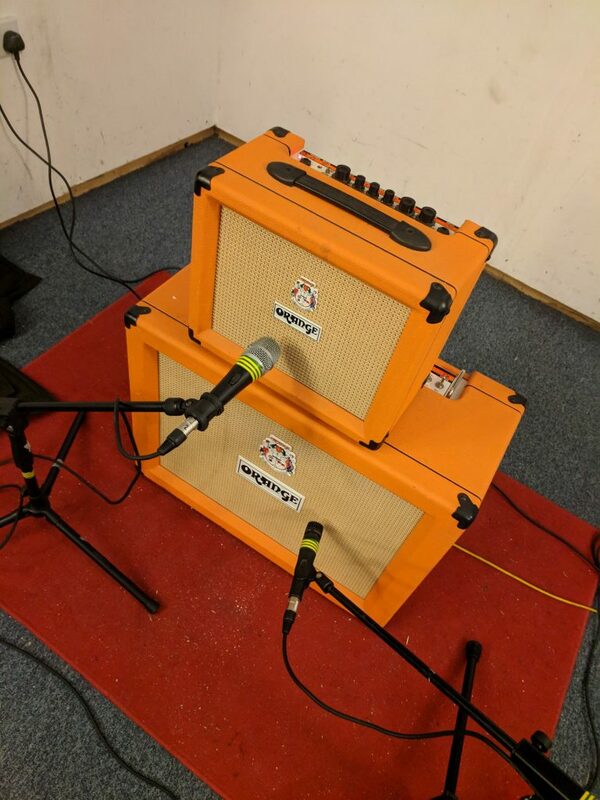 With my trusted Orange CR120 and Fender Strat plugged into a selection of Fuzzboxes, (inc. Big Muff, Beast Master Deluxe & Soda Drive) we drove through most the main guitar parts pretty fast. After last weeks crammed session, I came back to finish/redo/layer up some parts on my own. It’s all came together pretty fast. 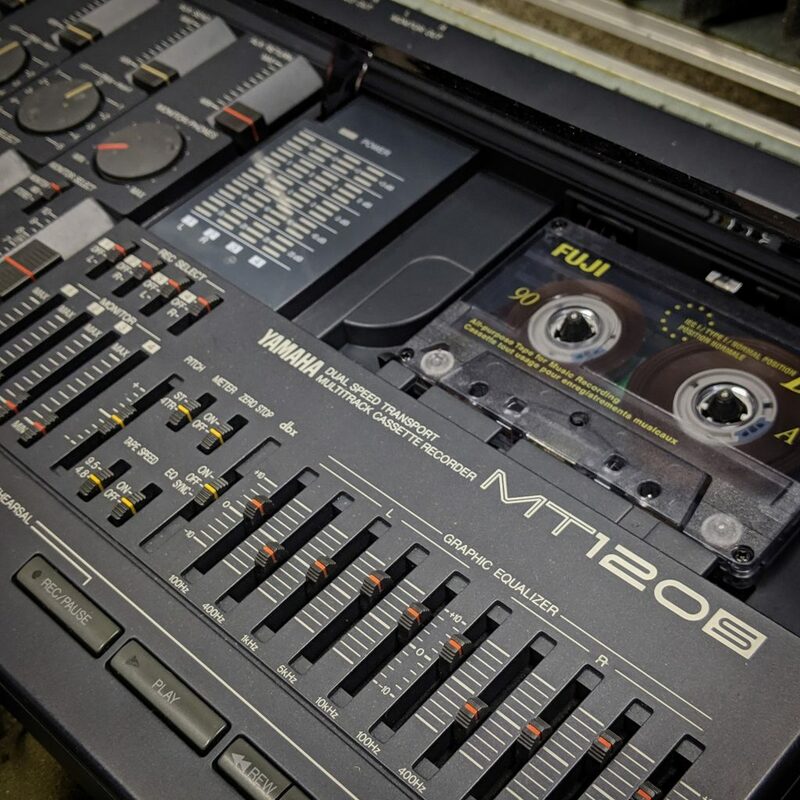 Excited to get some vocals on next, we have to finish 2 tracks soon for Cassette store Day. 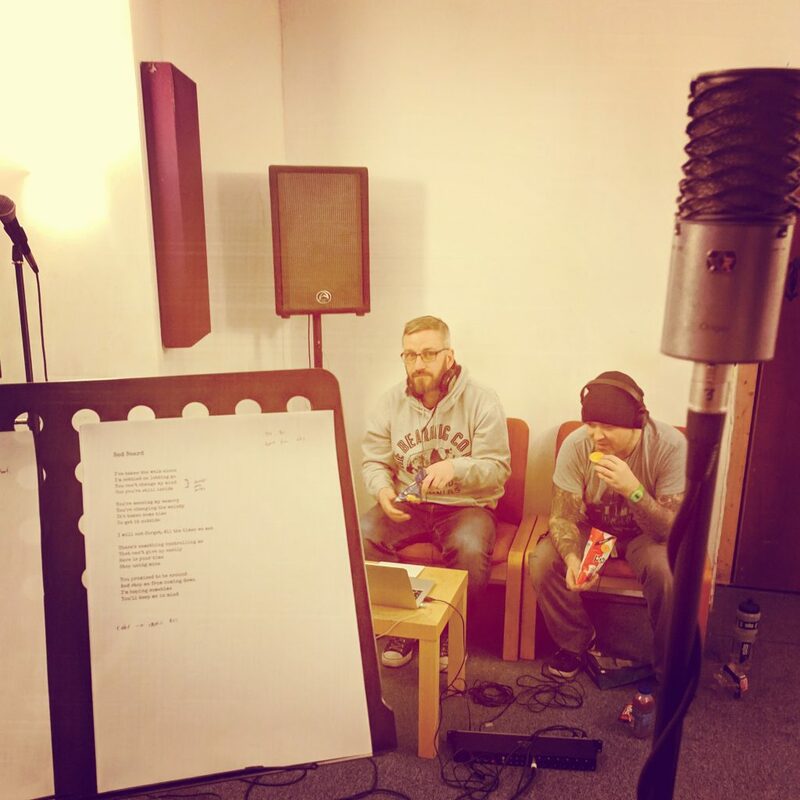 Session 5 & 6 – Vocals. With the deadline for Cassette Store day coming fast, we tracked the two we have in mind for the release first (Moving waves & Brainsick), and then through some of the other songs. 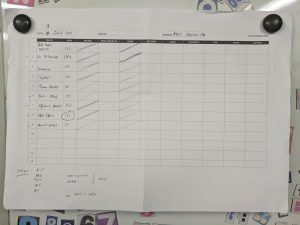 For Session 6 I came down on my own. It was cool to hear the other guys reaction to the vocals I had put down. This is coming together nicely, although we aren’t sure when/how it will be released yet. When we got back together after almost 2 years, I had a pile of almost 40 demos building up. It was time to get busy! When we discussed making another album, we decided the next release should be a mini album. Something short, raw and fun. After selecting 8 tracks from the list of 40 odd demos, we headed to the studio and jammed through them. 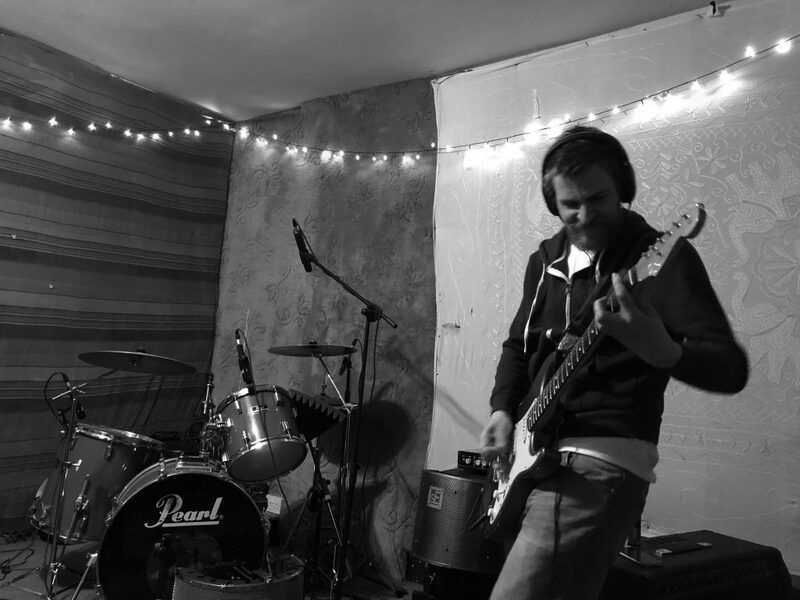 Instantly things came together and we had shaped the demos into complete songs. 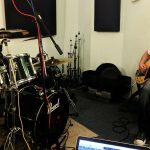 We tried something a little different to our previous recording sessions and tracks the Drums and Bass together. Dave and Lee steam rolled through the rhythm section like beasts. I remember, for a Drum room mic, we hid the microphone under the sofa at the back of the studio. Added a nice but trashy depth to the drums. For those interested, we used an Aston Origin mic. Same mic we used for lead vocals and acoustics. 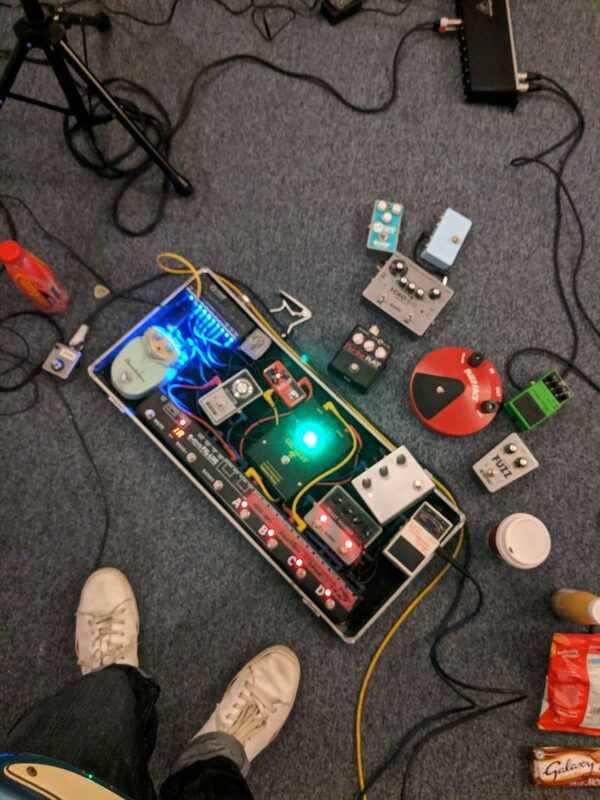 Bass was tracked using an old Russian Big Muff, a few Raygun FX pedals and an MXR Bass DI+. It is proper dirty, and sits in the mix like a 2nd guitar. I used my old Orange CR120 amp along with a Strat with a JB humbucker (usually I would only use my Jazzmaster-but this Strat is awesome!) 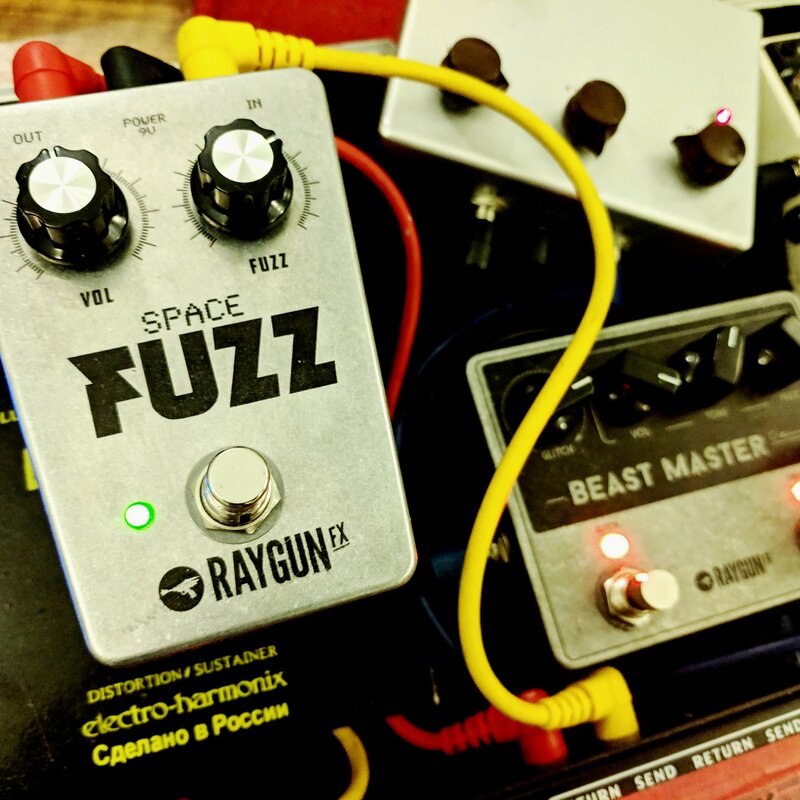 along with a selection of Raygun Fx pedals, (including a Beast Master, Soda Drive & Fuzzbender MkIII) and a Big Muff. 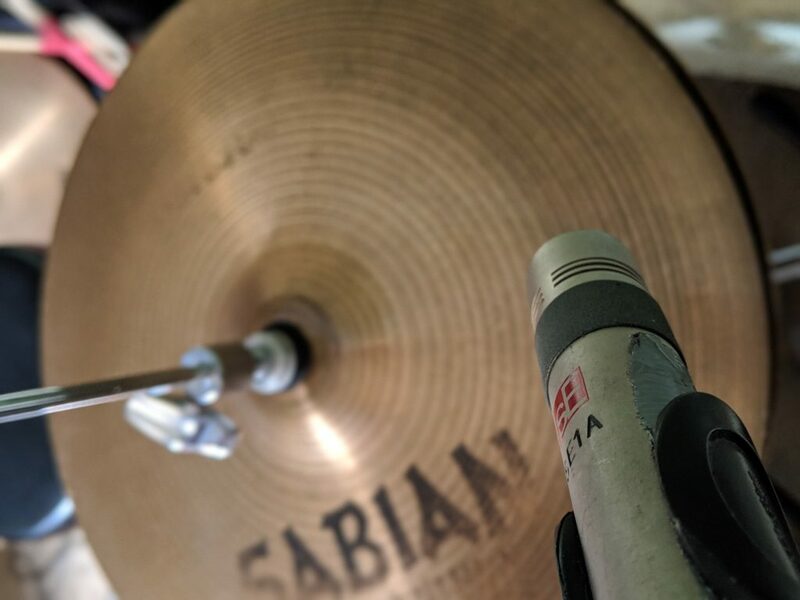 Recording was a simple set up of an SM57 for all the main guitar parts. The ‘telephone’ sounding guitars we all done using an awesome mic called the Wasaphone. It sounded so good, we used it on some vocals throughout the album. We always like to double track the main guitars, sometimes this includes solos. Sometimes it can be a lengthy process but it can sound so good! So far, we had mixed things as we had recorded so it was all coming together fast. 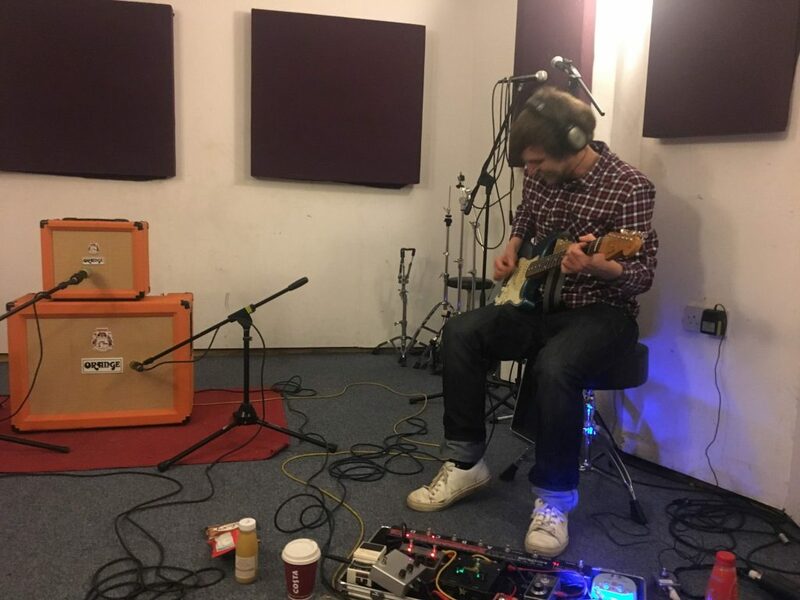 As most of these tracks we’re demoed, I had the Vocals ready to go, and did 2/3 takes to most songs and cut together the best bits, and then double tracking most the lead and backing Vocals to get them nice and thick sounding. 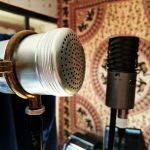 We use the Wasaphone mic again for a mix of clean/lofi vocals. It’s just so much more fun than using plugins to create sounds. Out Fri 27th July 2018 through Instereo Records, ’Skeletons’ is now available to order on 10” Vinyl, CD and Download.